Congratulations on getting started with THE most important aspect of SEO – keyword research! Perhaps you signed up to get one of our example keyword research packages – or maybe you’ve chosen to purchase one of our ‘done-for-you’ keyword research packages. Either way, this page will walk you through how to access your data and what to do with it. 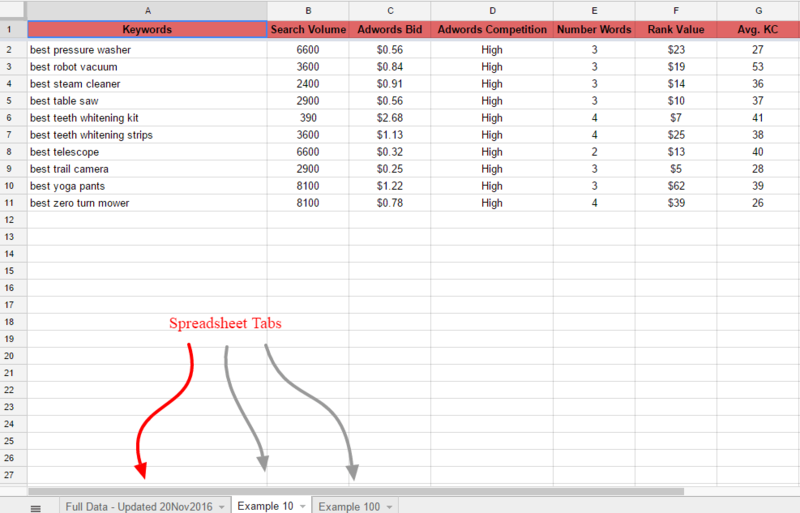 Your keyword research data arrives in the form of a Google Spreadsheet. Check your email inbox – it should arrive via email almost instantly after you sign up or purchase. Check your spam folder if you don’t see the email within a few minutes. The email will contain a link to a spreadsheet which contains the latest updated data. Each column displays data pulled in from Long Tail Pro. This data will be updated periodically and the last date that we updated it will be displayed on the title (name) of the spreadsheet itself (at the very top). Below are brief descriptions of what the data in each column represents. Keywords are terms that an end user would type into a search engine, such as Google. Tip: Use the search function (Ctrl-F on a PC) to find similar keywords and group those together to possibly use in the same article. Tip: Use this metric just to get a general idea for how much money is being spent online to advertise for this particular keyword. Higher amounts here generally indicate more profitable keywords. 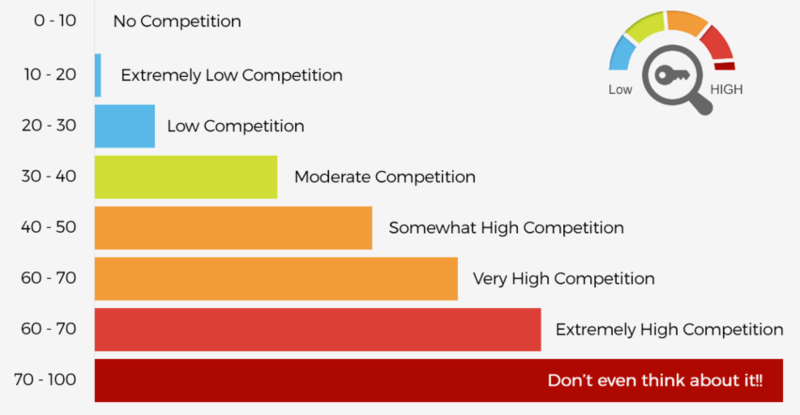 Tip: Try to go after keywords that have High or Medium Adwords Competition metrics. More advertisers for a particular keyword usually means that there is more money to be made for website owners in that niche. The total number of words in the keyword. “Long tail” keywords generally have more words and are usually lower in competition and easier to rank for. An estimated monthly value of ranking in the top organic search result. By default, this calculation uses the Adwords suggested bid and an estimated click-through-rate. Tip: If you use Long Tail Pro for keyword research, you can customize this value by setting it to use any monetization value (Amazon or other Affiliate sources) and any estimated click-through-rate. For Amazon niches – use the average price (on Amazon) for the product that will be promoted for that particular keyword. The SECockpit sheet provides a TON of data. I’m not going to explain every data column in detail here. If you want to see exactly what each of those columns represents – feel free to take a look at the official SECockpit Manual (starting on page 7). The two most important columns on this sheet are the Phrase (keywords) column and the Monthly Searches column. SECockpit has some really cool features built in that enable you to come up with way more (and better) keywords than other popular keyword tools are able to generate. For this reason – we include every single keyword (phrase) that SECockpit generates. Even the keywords that have zero search volume are valuable and will give you some really great ideas for topics to write about on your site. 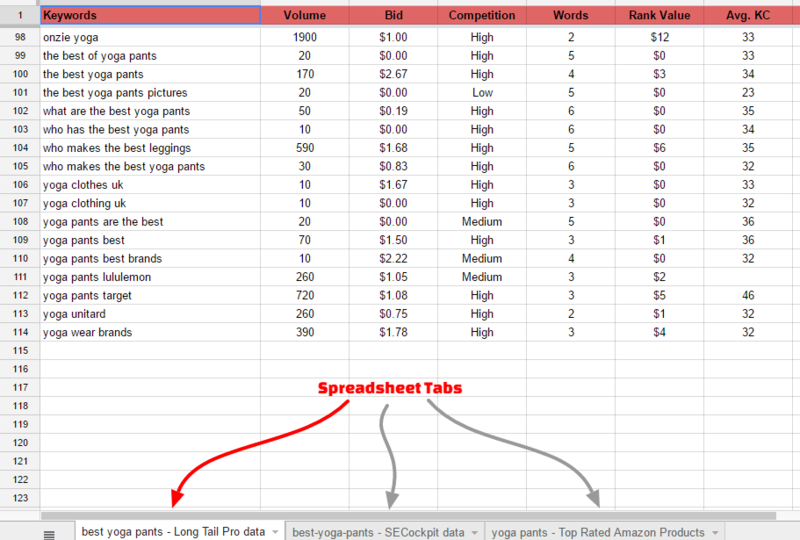 Again, this spreadsheet tab is only included for niches that have Amazon products to promote. This data is VERY important, powerful and useful. Using the incredible AmaSuite software, we collect data for the most popular (top selling) products on Amazon for the particular search term. We then filter that data to show ONLY the products that have minimum ratings of 4 stars from at least several hundred live reviews. Note: All AmaSuite data is subject to change daily. The data provided in the spreadsheet is accurate only on the day that it was extracted. 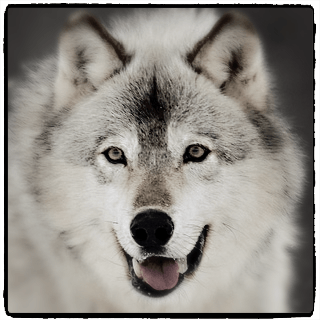 All AmaSuite data provided by Niche Wolf applies only to Amazon.com (United States). Consider picking up your own copy of AmaSuite if you want to do detailed Amazon product analysis and have the ability to filter the data. Reading This Page but Haven’t Purchased Yet? Coming soon… Our Keyword Research Packages For Sale page is still in its infancy. Maybe you can be one of the early-bird buyers!